Amish widow Hannah Yoder never intended to marry again. 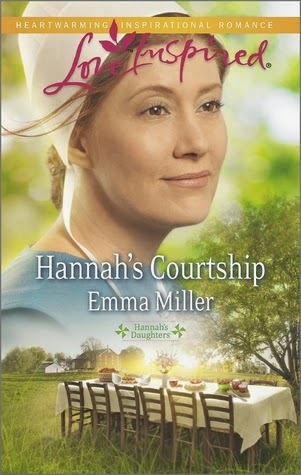 Yet when her friendship with veterinarian Albert Hartman begins to bloom into something more, Hannah wonders if perhaps she's finally ready for a new love. Albert waited his whole life to find the right woman, only to realize Hannah was there all along. But there's more than their friendship to consider. Albert is a Mennonite, born-and-bred, and Hannah cannot - will not - leave her Amish faith, not even for him. Does Albert have the courage to give up his modern life for Hannah…and will Hannah have the courage to let him? This was a wonderfully written Amish romance. The characters were engaging, and most importantly, they felt completely real. You could tell that Hannah's family was one of love as much as faith. They cared deeply for each other, and even though all her daughters save one were "successfully" married, they still worried about their mother, just as she worried about them. The fact that Hannah's youngest daughter Susanna was born with Downs Syndrome, was something that I have not found in other novels of this nature, so it was refreshing to see a character with a very well known condition, and seeing how Hannah struggled to deal with raising her every day. Susanna is desperately smitten with their neighbor David, who also has Downs Syndrome, and Hannah struggles with wanting to keep them apart as to not give her daughter "false hope" over a relationship that Hannah struggles to accept, while at the same time not wanting Susanna to be caught in a compromising situation that would raise issues for them within their strict Amish community. I found the relationship between Albert and Hannah to be endearing as well as sweet. The struggles that they had to overcome in order to be together and find their own happiness together were real to the story, and I found myself rooting for them, and worrying for them as they took their case to the elders in order for permission to court. This is a book that is sure to be a hit not only with those who enjoy Amish Romances, but also with those who enjoy just a good clean Christian romance as well.